A prequel to Michael Bay’s five film strong Transformers franchise, Bumblebee takes what the other films did and generally does the opposite, offering an enjoyable movie that is just as focused on telling a character-driven story with real heart as it is on delivering gigantic action scenes. The film opens in typical Transformers fashion with a big battle on the planet Cybertron between the Autobots and Decepticons, that culminates with Optimus Prime (Peter Cullen) sending the young Autobot B-127 (Dylan O’Brien) to Earth in order to scout out a new home for them. B-127 crash lands in California in the year 1987, where he is discovered by Sector 7 Agent Jack Burns (John Cena), who assumes him to be a threat. When the Autobot narrowly escapes from a fight with a Decepticon, who followed him to our planet and rips out his voice box before leaving him for dead, he disguises himself as a bright yellow Volkswagen Beetle and takes refuge in a junkyard behind an auto shop. At this point, the focus shifts almost completely to our planet, and we start to follow Charlie Watson (Hailee Steinfeld), a teenage girl who is still grieving the death of her father, and spends her spare time trying to fix up the old Corvette that her dad was working on before he passed away. When Charlie finds the Volkswagen Beetle on her 18th birthday, she takes the car home to her garage to fix it up. It’s not long before she discovers that her new automobile is actually a giant robot from outer space, and she ends up forming a bond with the Autobot, giving him the name Bumblebee. But he is being tracked by a pair of Decepticons, Shatter (Angela Bassett) and Dropkick (Justin Theroux), who followed him to Earth and have tricked the government into helping them, and it’s up to Charlie and her new friend Memo (Jorge Lendeborg Jr.) to help save him. A surprising amount of Bumblebee is actually focused on the human characters, and the film is carried pretty much every step of the way by Steinfeld, who really elevates the material and also brings a good deal of pathos to her portrayal of Charlie. The film is directed by Travis Knight, a lead animator at Laika who previously directed Kubo and the Two Strings and is now making the jump from stop motion to live action, and Bumblebee works because Knight is more concerned with telling a heartfelt story rather than just delivering empty spectacle. Don’t get me wrong, there is still a lot of spectacle here, and the usual technical wizardry that goes into showing the Transformers taking different forms is on full display. But the screen isn’t overloaded with robot mayhem this time around, with Knight generally limiting the battles to two or three Transformers at a time, which makes the action scenes here way cleaner and easier to follow than they were in Bay’s overcrowded films. The film mainly functions as a coming of age adventure that offers a fun and sweetly nostalgic throwback to the decade in which it is set, complete with nods to titans of 1980s cinema like Steven Spielberg and John Hughes. There are obvious allusions to the former’s E.T. the Extra-Terrestrial and a nice reference to the latter’s teen classic The Breakfast Club, and while Bumblebee isn’t in the same league as these ’80s classics that it takes its cues from, it is a fun and deeply sincere throwback to them. Spielberg even serves as executive producer, as he did on the previous Transformers films. Where as the other films became cacophonies of clanging metal, Bumblebee actually has real flesh and blood characters, a good deal of heart, and a story that is simple enough to follow yet still strong enough to be engaging, without getting too bogged down in the mythology of this world. The film also clocks in under two hours, which is a welcome change from the bloated running times of the other Transformers films. It’s the best film in the series by a long shot, and a thoroughly fun movie to watch. The Blu-ray also includes an array of bonus features, adding up to well over an hour of extra stuff in total. First up are the two short pieces Agents Burns: Welcome to Sector 7, a brief introduction featuring John Cena’s character, and the animated motion comic Sector 7 Adventures: The Battle at Half Dome, which expands upon the physical comic that is tucked into the package’s cardboard slipcover. Next up are the nine deleted and extended scenes Original Opening, Drive to Karate Class, Birthday Present, Car Wash and Beetle Breakdown, Charlie Drops Off Mona and Conan, Decepticons Inspect the Armory, Drive to Cliff, Sector 7, and Appliance War. There are some entertaining moments here, but they would have added extra length to the film’s lean running time, and the last one (Appliance War) is better left on the cutting room floor. They are followed by the five outtakes Burns Meets Bee, War Room, There’s a Door in My Way, Charlie in Trash, and Saved the World. The short piece Bee Vision: The Transformers Robots of Cybertron shows the film’s opening battle with freeze frames to tell us which Transformers are involved in the action. Last but not least, we get the fairly substantial five part feature Bringing Bumblebee to the Big Screen, which is divided into the different chapters The Story of Bumblebee, The Stars Align, Bumblebee Goes Back to G1, Back to the Beetle, and California Cruisin’ Down Memory Lane, which mainly focuses on the film’s ’80s aesthetic and is the longest and best of the bunch. 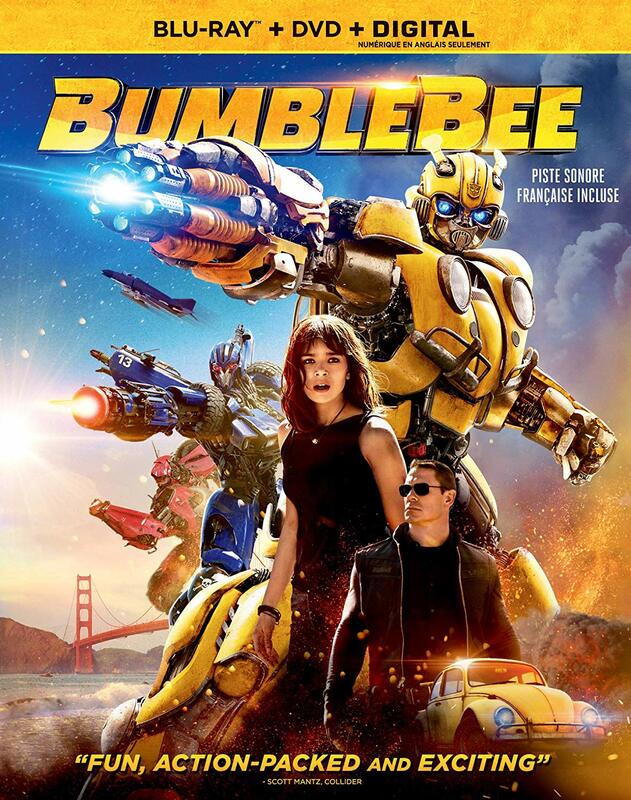 Bumblebee is a Paramount Home Media Distribution release. It’s 113 minutes and rated PG.